A best-in-the-business organizing service offers surprisingly simple solutions for bringing order to five commonly clutter-prone zones. In every home, stuff always seems to pile up in one particular area, be it a kitchen drawer, an entryway surface, or the far corner of a seldom-used room. With locations in nine major cities, the organizing service NEAT Method has plenty of experience helping people stem what often feels like a ceaseless tide of clutter. What makes the NEAT Method so in-demand? They don’t just get your house in order; they set you up to keep it that way. “We make your space functional in a way that works for you so that, when we leave, it’s easy for you to maintain it,” says Marissa Hagmeyer. We asked NEAT Method for advice on undoing the powerful pull exerted by the magnets for messes we all live with. Read on to learn surprising—that is, surprisingly simple—strategies for your clutter-prone zones. 1. Be clear in the kitchen. 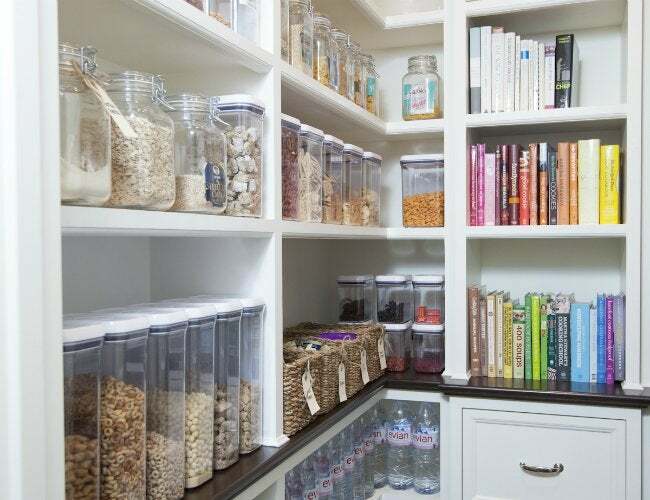 “If you can see it, you’ll use it; if you can’t, you’ll forget it’s there,” says Hagmeyer, who favors transparent containers, wire baskets, and tiered racks for the pantry and cabinets. Armed with organizers that really show off the goods, group like items together. “If all your baking supplies are in plain sight in one place, you won’t have three jars of cinnamon taking up space,” she explains. Also remember: If you can’t eat it, drink it, or cook with it, banish it from the kitchen. Never mind the fact that there’s no room for it—the grime is simply unsanitary. “We’ve seen countertops strewn with mail, tubes of sunscreen, even hairbrushes,” Hagmeyer says. 2. Keep a lid on the living room. 3. Focus on efficiency in the bath. “In the morning, every second counts,” Hagmeyer says, “so bathroom de-cluttering will get you out the door faster.” Throw out expired cosmetics, vitamins, medicines—all those bits and bobs that are making it harder for you to find and grab what you need. Once you have thinned out the ranks, look at the lineup of what’s left and toss anything you no longer use. “Americans are crazy for grooming products but we rarely finish everything we try, so we wind up with lots of half-filled bottles,” she explains. With unnecessary supplies out of the picture, you’d be surprised by how much space you have left for storing your daily go-to items. Keep those within easy arm’s reach, and pay attention to the little details. For instance, if you’re right handed, keep necessities on the right side of the shelf. There’s a little-known secret about dresser drawers: You can probably fit more in, and without taking anything out. Maximizing the limited space depends on applying the right technique. “Instead of folding T-shirts the traditional way, add one extra fold to make a more compact rectangle,” Hagmeyer says. “Then, rather than stack, slip shirts into the drawer as you would a file folder.” The system works for sweaters, jeans, scarves—anything you can fold, you can file away. 5. Bring beauty to personal space. It’s your workshop, craft room, garden shed, whatever—so isn’t it your right to keep it messy, if you that’s what you want? Sure, if you don’t mind shooting yourself in the foot. “Mayhem isn’t conducive to productivity or pleasure. Organization in DIY areas helps you get more done,” Hagmeyer says. “Plus, these places ought to inspire you!” How’s that for an excuse to splurge on yourself? In the name of productivity, go trash whatever old coffee cans have been substituting for organizers and treat yourself to beautiful, functional storage items. They’ll be sure to make you want to not only to start your projects, but actually finish them.